Ramshackle buildings, skinny kids with sooty knees, and shacks serving as corner stores selling dusty home wares. 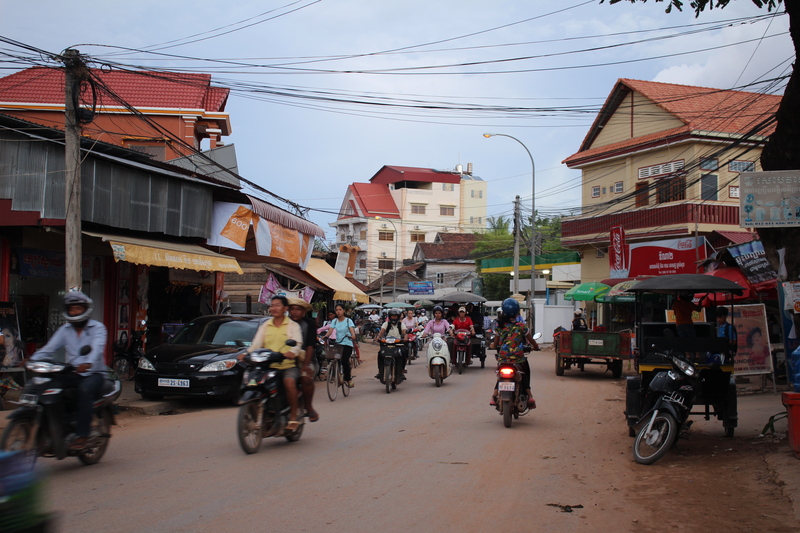 Simon and I had arrived in Siem Reap, Cambodia. Home to the iconic temple of Angkor Wat, Siem Reap is every backpacker’s dream in Southeast Asia. Ancient temples covered in a tangle of tree roots, intricate reliefs of religious significance carved onto every surface, and exponentially large scale temple compounds. Like many backpackers before us, Simon and I came here to explore the largest religious monument in the world. As we rode from airport to our hostel in a tuk-tuk, dusty scenes of a meager landscape flew by: dirt roads, expansive farmland with piles of trash next to scanty crops, metal shacks selling anything from food, home necessities, to motorbike repair services. We competed on the road with other tuk-tuks, cars, and bicycles. Skinny kids dressed in white and navy uniforms several sizes too big pedaled past us in their flip flops on the way to school. 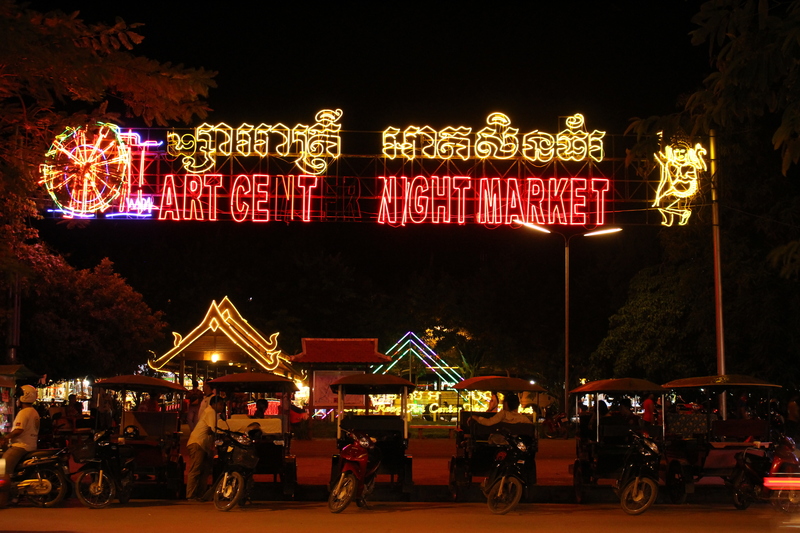 Rich in culture, the number of tourists that visit Cambodia have more than doubled in the past ten years. But the country still remains extremely poor and continues to grapple with the crippling effects war and genocide from decades ago. Even amid the tourist bubble of Siem Reap, Simon and I could still feel and see the deep-felt scars of a country struggling to heal from its devastating past. I can’t even begin to imagine what the landscape is like in a smaller town, unseen by foreigners and tourism. Our hostel was less than a mile away from Pub Street, which is the touristy downtown area, so we decided to take an evening walk. Motorcycles, motorbikes, and tuk-tuks whizzed by us, kicking up dirt to the side of the road, while kids horsed around on bikes now that school was out for the day. 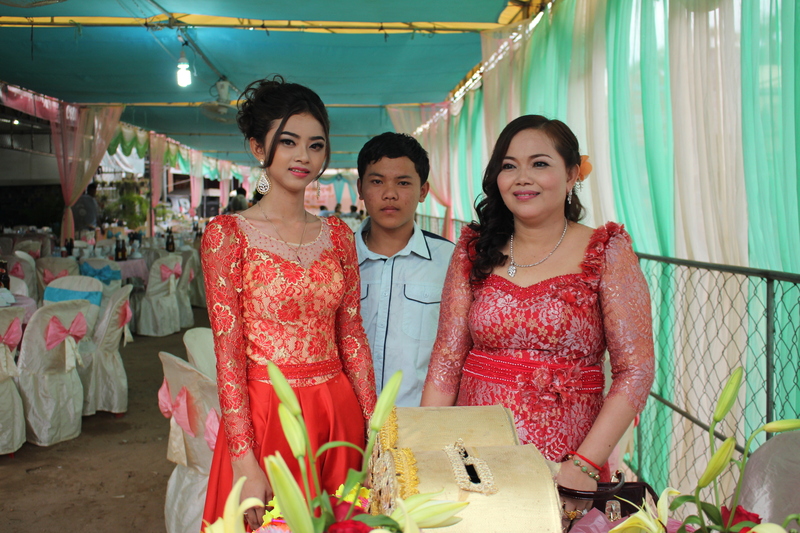 We even witnessed what looked to be a wedding banquet about to take place. The juxtaposition of poverty and wealth presented itself everywhere we went. It didn’t matter if it was a shiny four-star hotel or a small family owned business, newly constructed multi-story buildings and ground level dilapidated shacks all stood equally side by side along the dusty road. 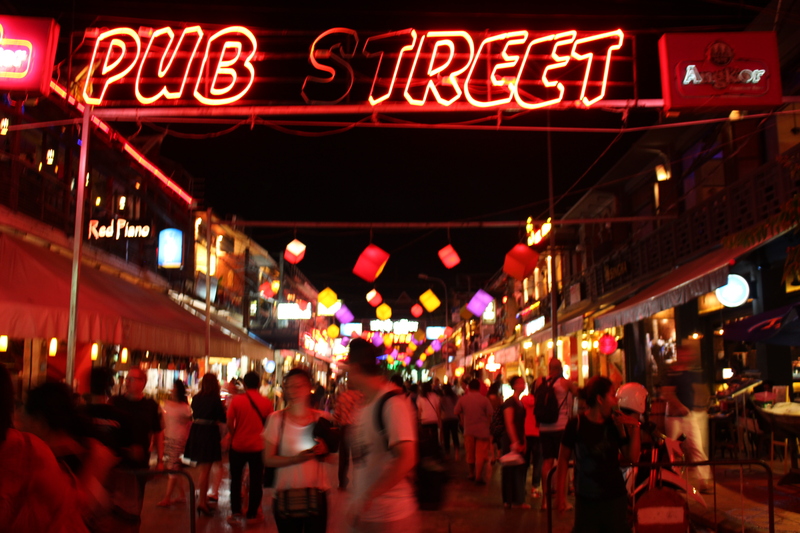 A flickering neon sign spelling out “PUB STREET” welcomed us. Souvenir shops, watering holes, and fancy restaurants with international cuisine make up this relatively jazzed up area of town. 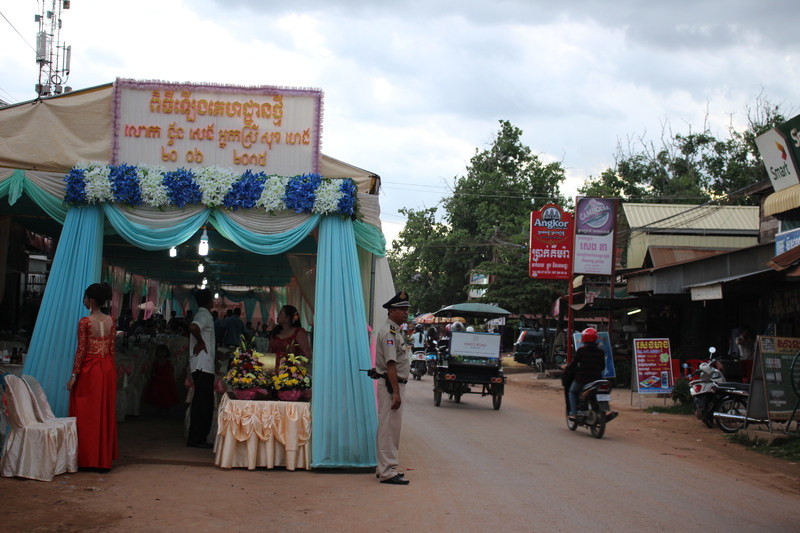 Mixed in with the touristy aspects was local street food that served up authentic traditional Cambodian dishes. Although I’ve eaten at the few Cambodian restaurants that we have back home, my memories of the dishes and flavors seem to escape me. 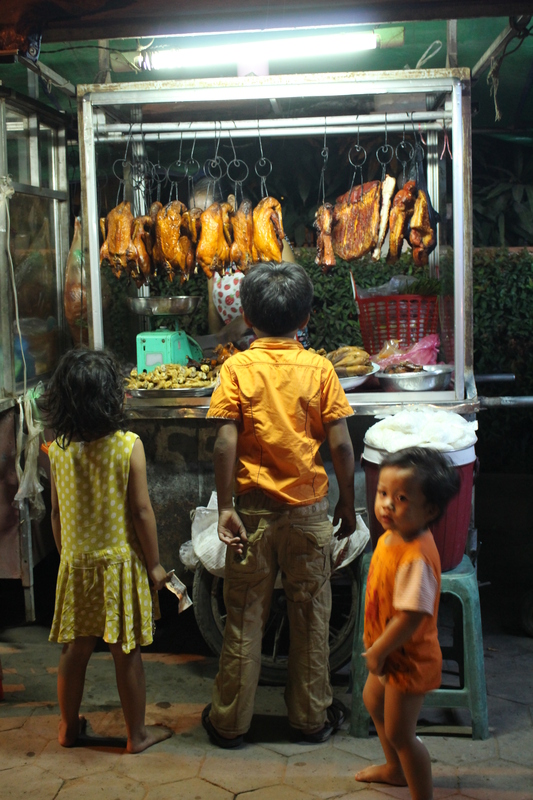 I didn’t know what to expect for our first meal in Siem Reap, but I was pleasantly surprised. Beef lok lak, and spicy chicken soup more than satiated our appetites with their simple flavors. The mix of savory, tangy, and a hint of heat blended together was somehow familiar as if I was eating a home cooked meal, yet completely foreign too. Judging by the family owned establishment, I guess I could say this was a home cooked meal away from home. Refreshing ice cold pineapple smoothies were all that we needed to quench our thirst in the hot summer night. 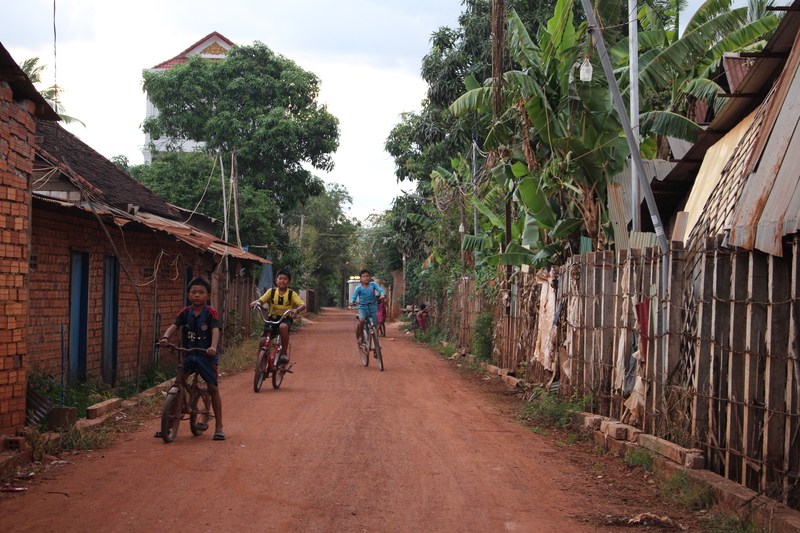 We had only been in Siem Reap for less than 24 hours, but our first taste of Cambodia was an eye-opening one. cool! glad you enjoyed your first night in cambodia. khmer cuisine really has its own palate- at one meal you have a variety of flavors; from pickled sour mango atop a crunchy fried fish, to sour chicken lime soup, to all the complex herbs that are ground up in a mortar and pestel to make ‘kroeung,’ a special paste that’s used in all kinds of stir frys, soups, and various dishes. hope you enjoy the rest of your time there! We only had a small sampling of their cuisine – I’m sure we still missed out on a ton of good stuff!